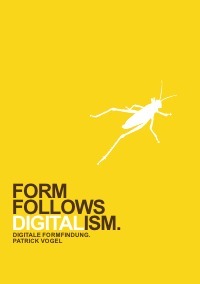 This book (in German) by Patrick Vogel is about digital formfinding with Rhino and Grasshopper, explains the software very quickly and shows many of his experimental work results. thanks for writing it in German, the entire world architectural community will learn the language for you guys! Sorry, man. Translating in progress... Arturo Tedeschi (Parametric Architecture with Grasshopper) also needed time to translate from italian to english! Wen do you expect having the English version ready? It looks like a really good book. Looks like a really good book. For wen a English version? Any chance at the beginning of next year?